Hi again! Welcome to the Coronado’s Pool Renovations blog, where today we’ll be discussing pool coping materials. If you don’t know about us yet, Coronado’s is a small family owned business operating locally in the Delaware and Chester County areas. 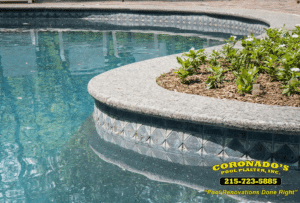 We are Pottstown pool remodeling specialists who care about our customers and community, and we love making pools as functional and beautiful as possible. We have been operating out of this area for over 25 years, and we’ve learned a thing or two about customer satisfaction in that time. We offer the best warranties available on the market, alongside competitive rates and the highest quality of masonry expertise. Our teams are trained in every stage of the pool care life cycle, including preparations, repairs, cleaning, remodeling and more. So if you need pool work done, there is no question of who you should call. Coronado’s is the safest choice. Bluestone pool coping is one of our most beautiful and visually popular pool coping options. Because the material can be used in other outdoor implements, like decks, patios and other pool surroundings, it allows your backyard to blend seamlessly together in a unified style. The tile around the pool’s edge can also be polished to a slip-resistant finish, which makes it very safe and family-friendly compared to some other traditional options. When it comes to pool coping, there are several great options to choose from, so before you make any decisions, we’d recommend reviewing some of our popular materials on our tile and coping page. Looking to update the coping on your swimming pool? Want ideas on good materials to use for your project? Want to get your pool up to higher standards before next summer? You know who to call! Get in touch with Coronado’s Pool Renovations today for a free consultation, and we’ll provide you with an estimate at no charge. We can help you complete your dream renovations, as well as provide further advice on materials for your specific situation. With rates, quality and the personal touch that we offer, you’ll be very happy you chose Coronado’s for your pool care needs.